Looking aft from the fore mast. 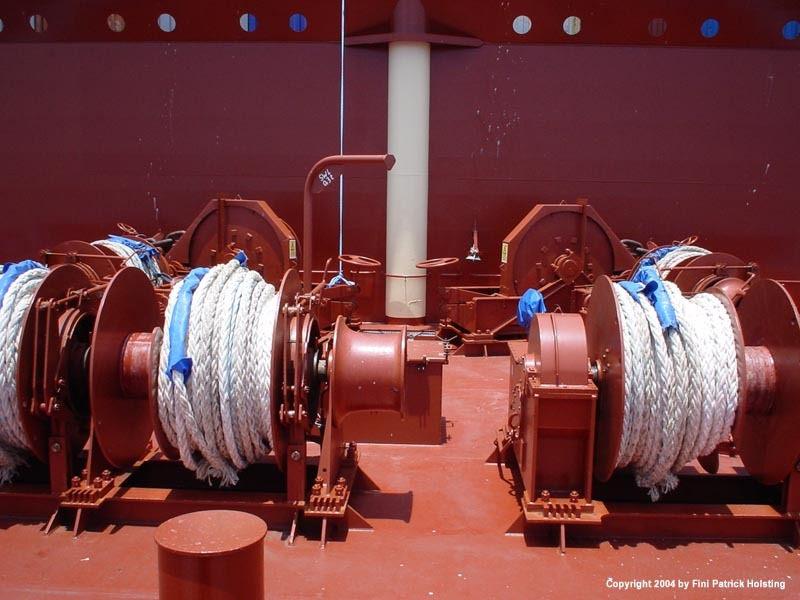 Two of the mooring winches forward, capable of pulling more than 20 tonnes. The ropes can take about 70 tonnes of force before breaking. 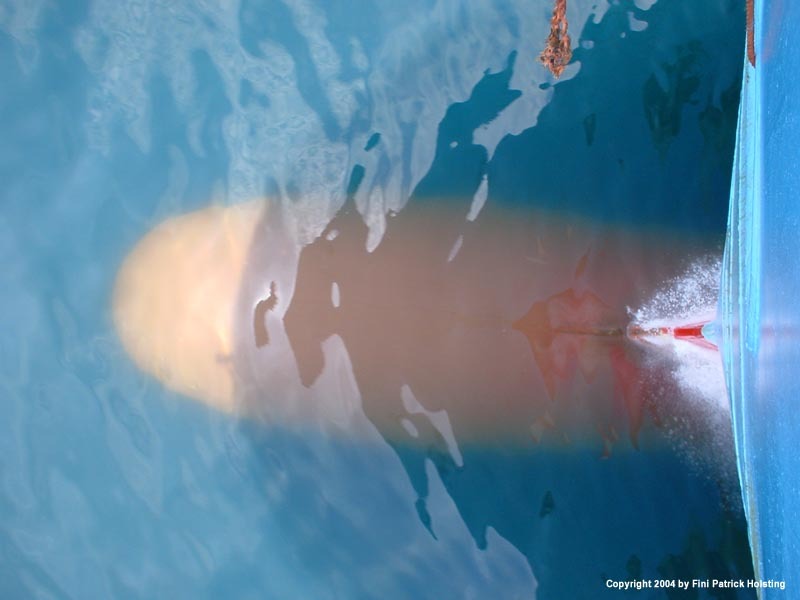 The bulbous bow during cruising in calm waters. 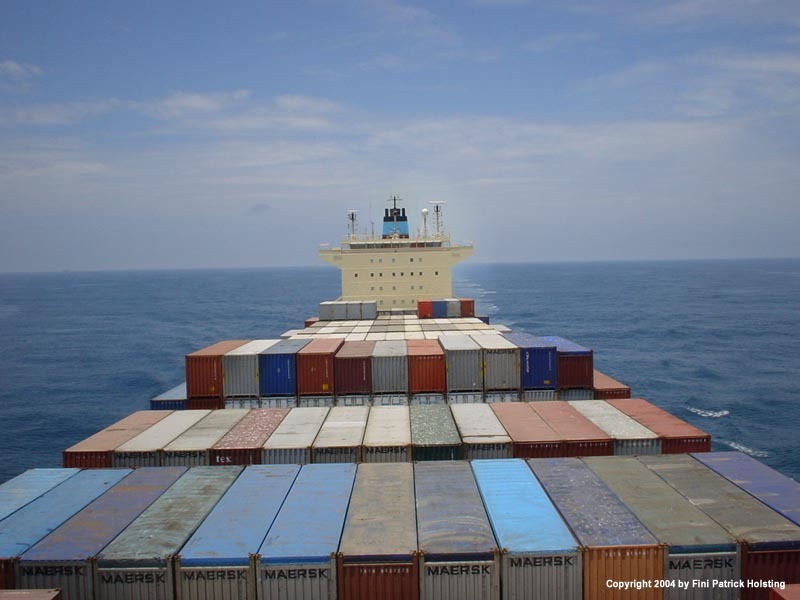 We were doing around 22 knots at the time. 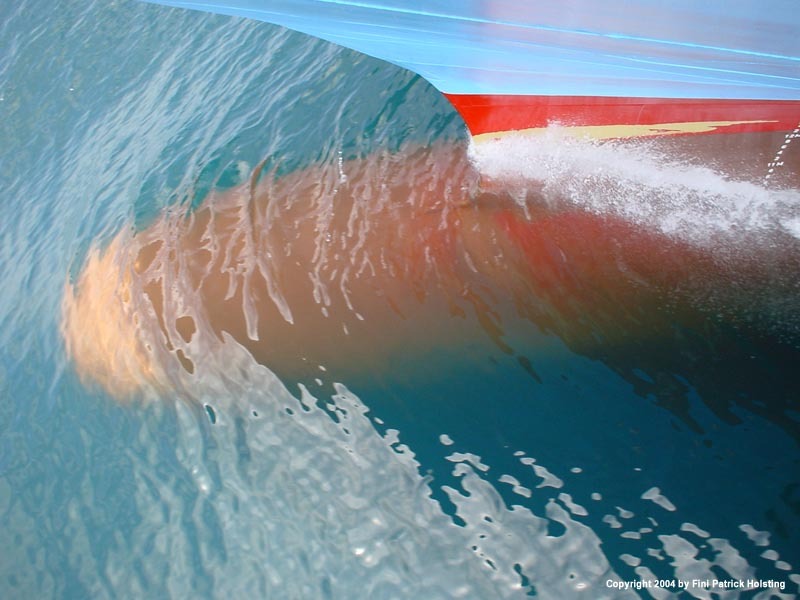 The dark red paint covering the bottom of the ship is so called anti fouling paint. 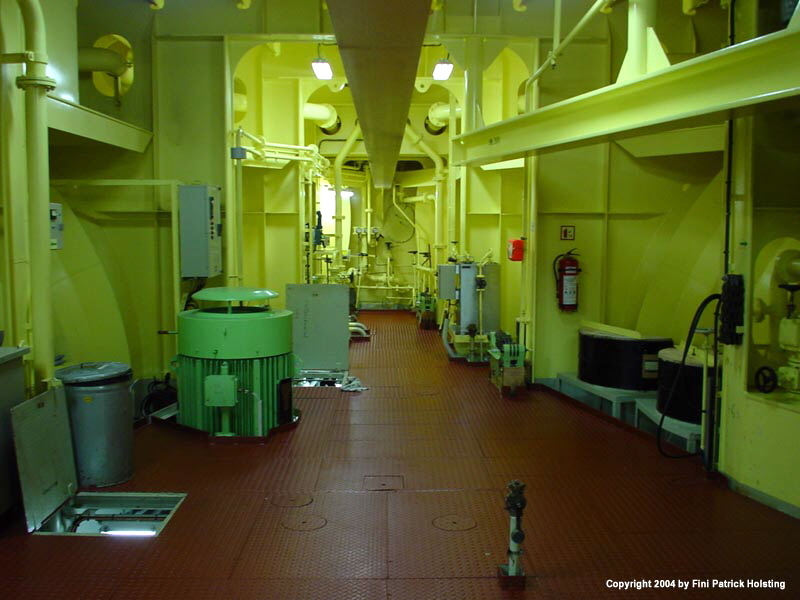 It is designed to come off slowly as time passes, thus preventing marine growth on the ship. A smooth bottom is essential for good fuel economy. Leaving Balboa for the fifth time. It was my last time in Balboa during this trip. During my third time in Miami the Chief Officer John rented a car to have a look around, and asked me if I wanted to join. We had a good trip around Miami and went to Fort Lauderdale too. 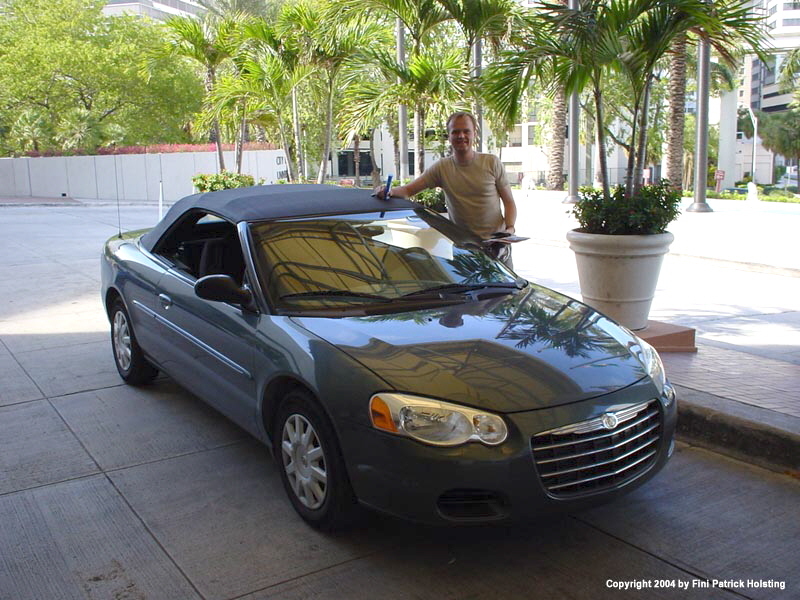 It was nice being out and driving around on our own, especially when the weather was so great, and we were driving a Chrysler Convertible. 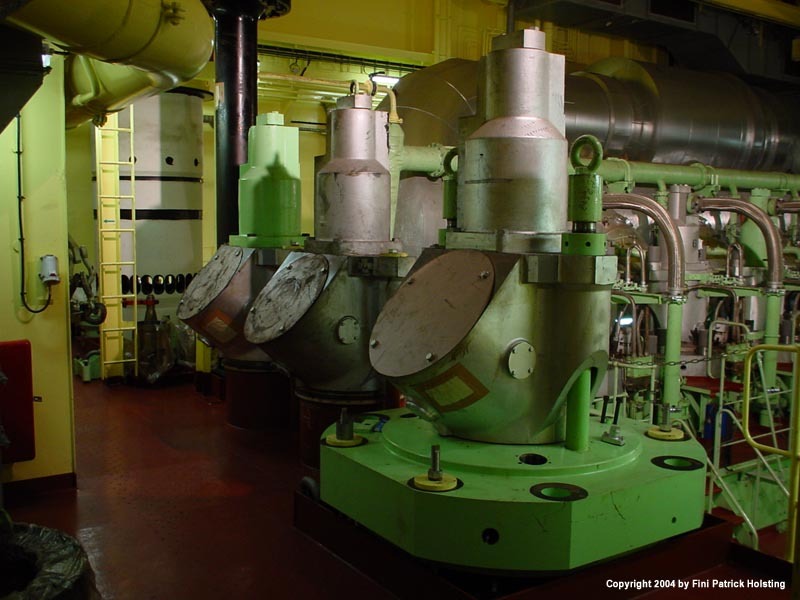 The three spare exhaust valve housings for the main engine, the Sulzer 7RTA96C. The front most one has a cylinder cover attached at the bottom. 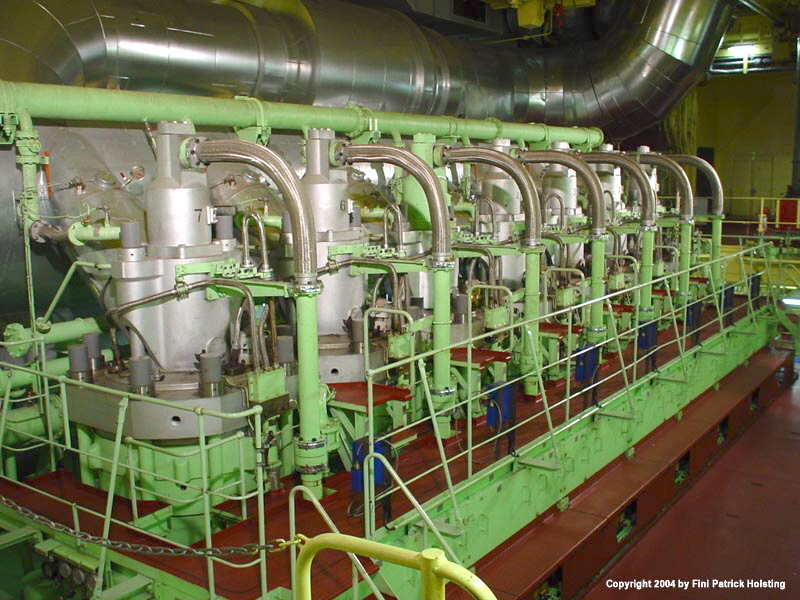 The main engine with its seven cylinders of 0.96 meter bore. 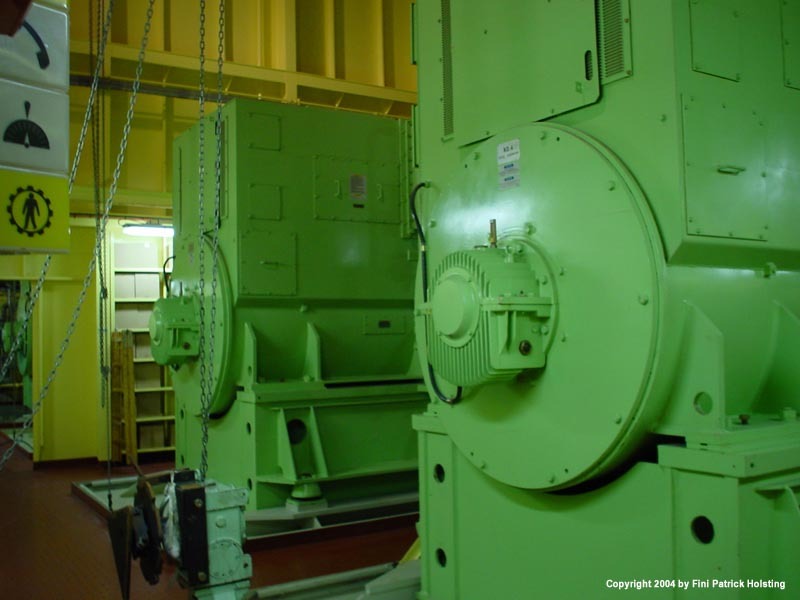 Two of the four power generating auxiliary engines. Seen from the other side, the generators come into view. 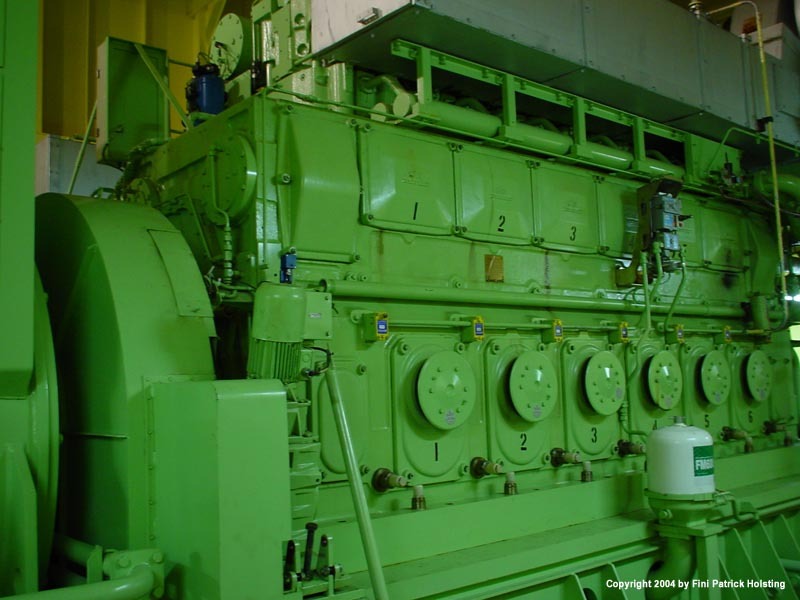 Auxiliary engine no. 4. The flywheel is hidden under the big round screen to the left. Want to know what it sounds like, where I'm standing? Click here! 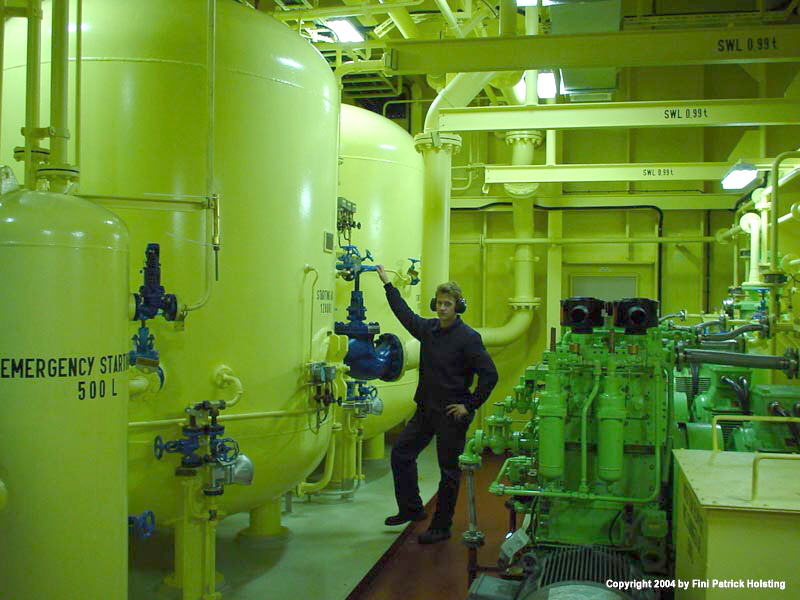 Here I'm standing beside one of the two 12,000 liter starting air cylinders. 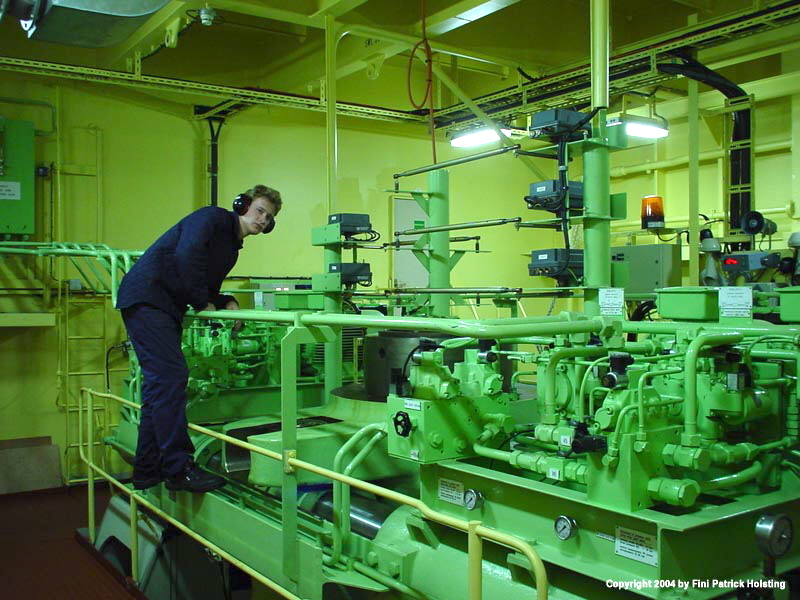 Both the main engine and the auxiliary engines are started by compressed air, and these cylinders store the air under a pressure of 30 bars. 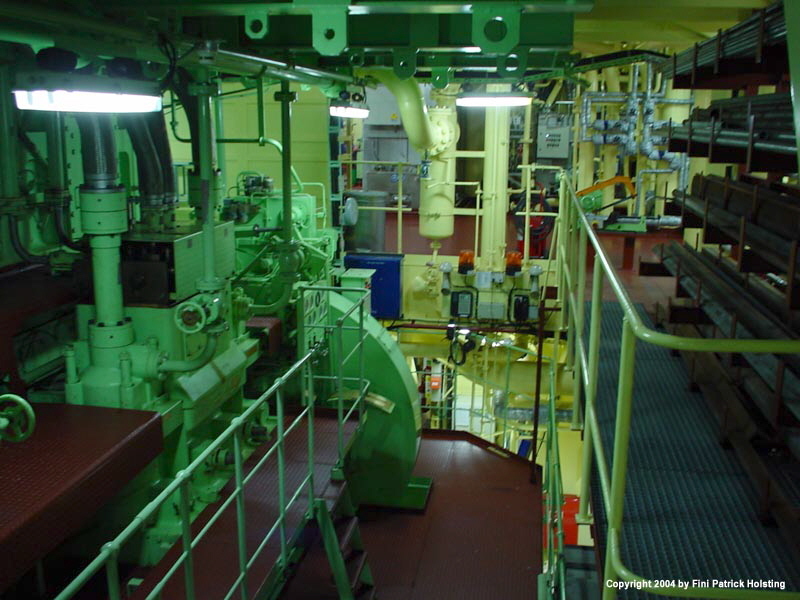 The steering gear, which turnes the rudder. 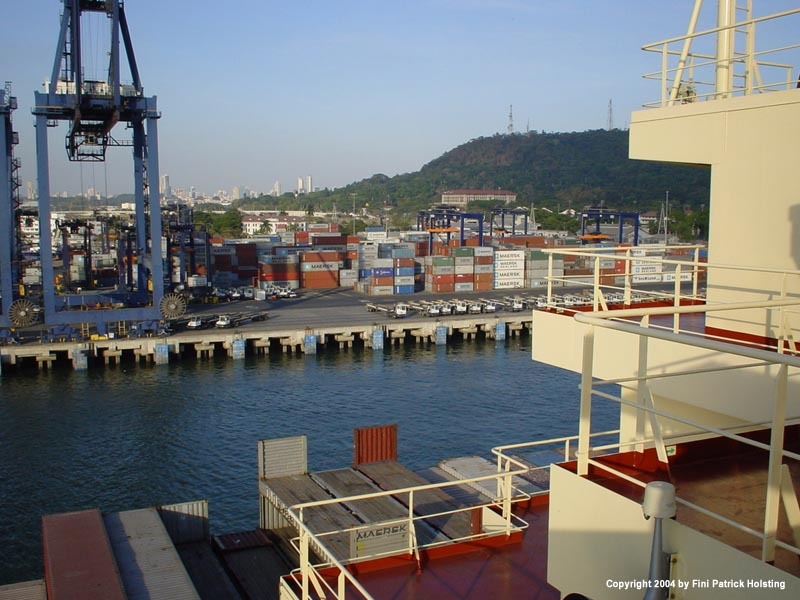 It consists of four hydraulic power packs and two large double acting hydraulic pistons. If you ever wondered what the inside of a funnel looks like, this is it. This is actually the so called engine casing, and the exhaust pipes run in the middle to the top (huge silver pipes visible in the picture). 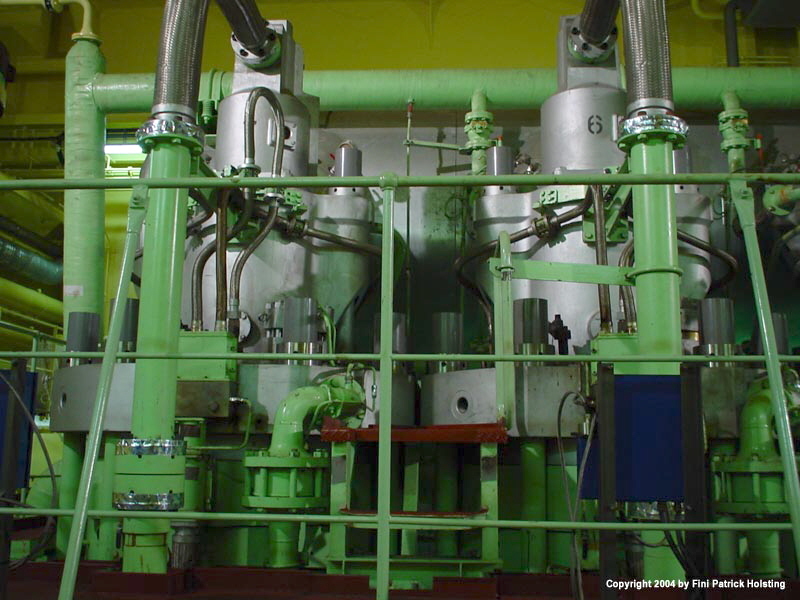 The largest one is the exhaust boiler, a simple container, where the heat from the exhaust gas is transferred to water, generating steam. In the middle of the picture the emergency manouvering console on the main engine, from where the mighty engine can be run locally. 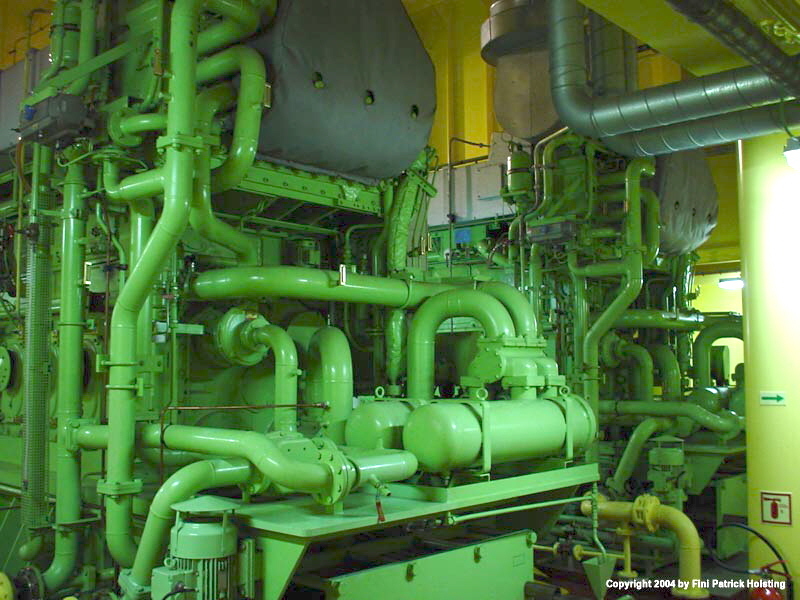 The aft bottom of the engine room, the shape of the hull can clearly be seen, as the ship tubes in toward the aft and the propeller mounting. 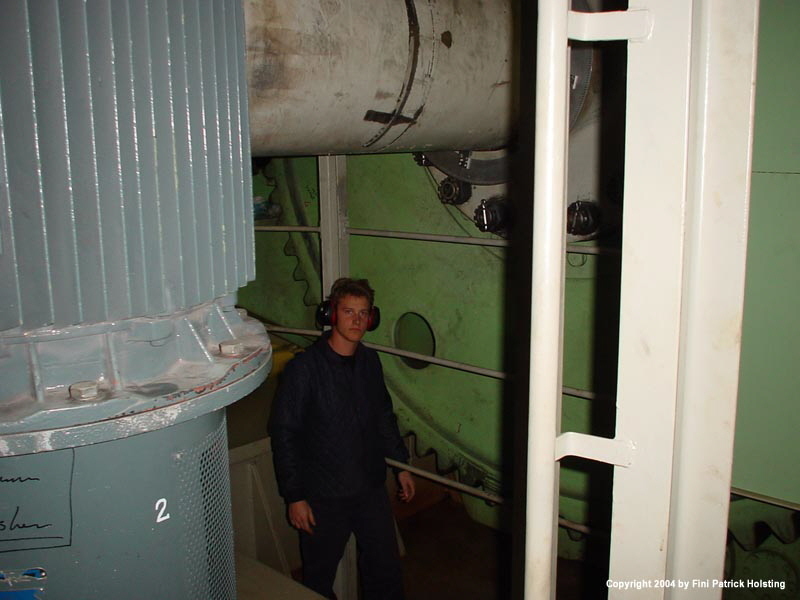 Here I'm standing beside the huge flywheel of the main engine (main engine was not running). 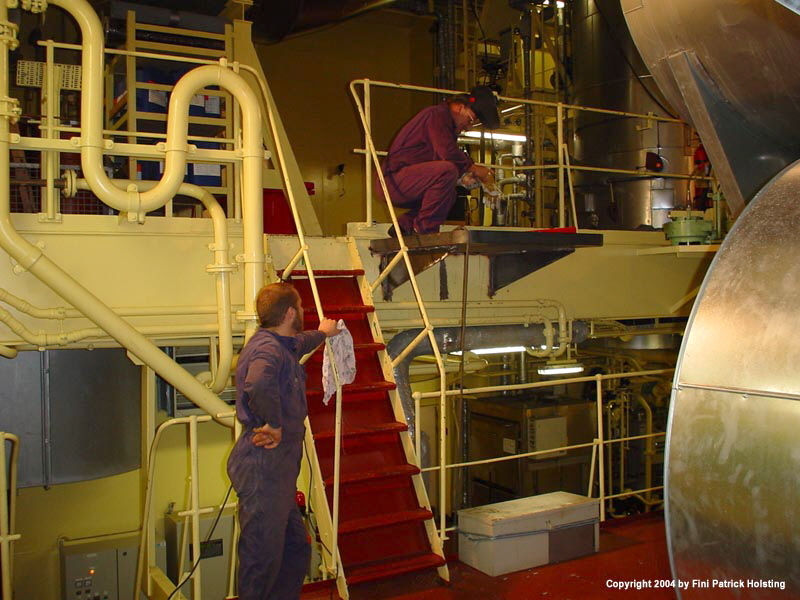 My good friends the polish repair men Witold and his son Bogdan doing welding work in the engine room. A spare piston and a spare cylinder liner for the main engine. 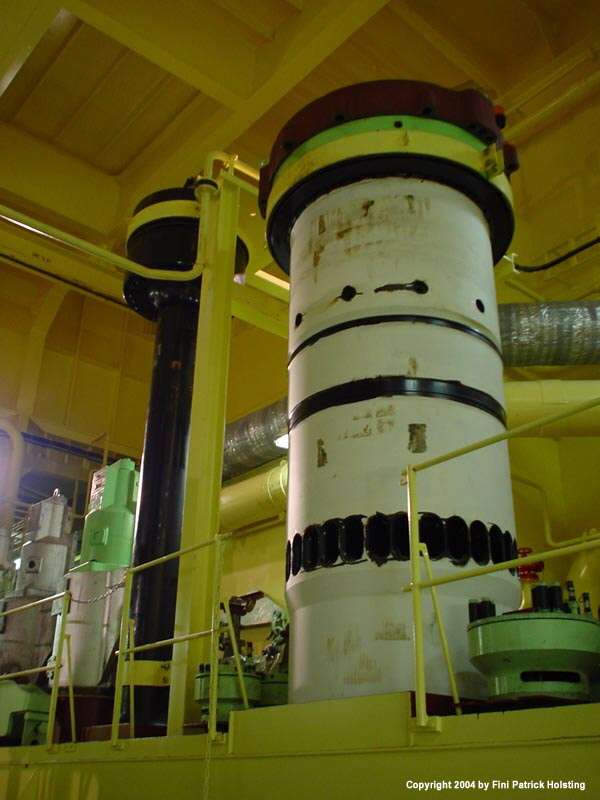 The piston itself weighs 4.5 tonnes. Cylinder no. 6 and 7 on the main engine. 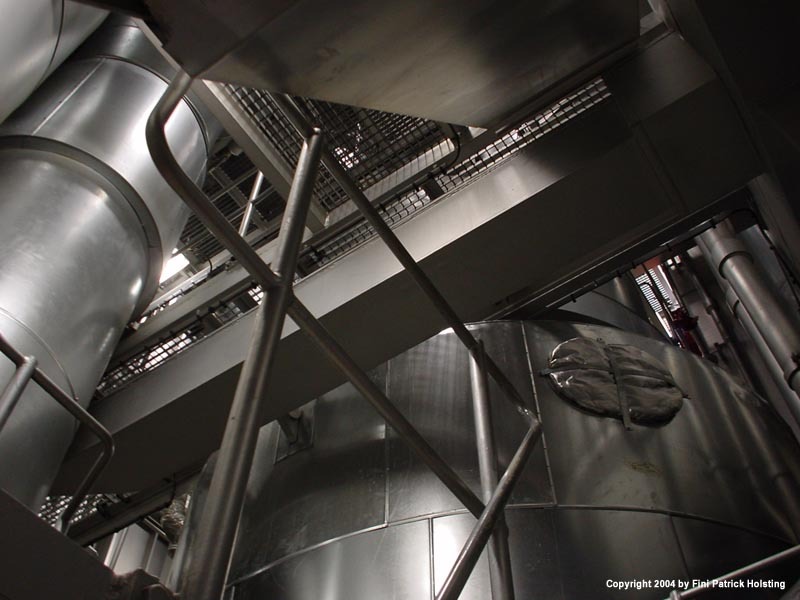 This is only the top of the engine, it spans four floors down and ways around 2,000 tonnes!